The range of the mongoose lemur is northwest Madagascar and the Commoro Islands. Mongoose lemurs inhabit moist forests and canopy forest mixed with scrub and brush. 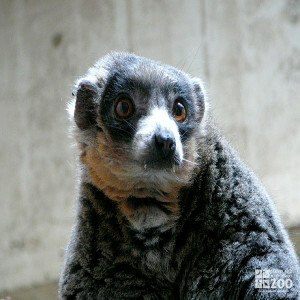 Mongoose lemurs are diurnal for the part of the year in which they feed on fruit and new leaves. In the dry season, when fruit and new leaves are not available, they become nocturnal and feed on nectar. When nocturnal they sometimes feed 80% of the time on a single species of tree. On Madagascar these lemurs live in small family groups consisting of a mated pair (which may remain together for many years) and their immature offspring. Occasionally older offspring remain with their parents for a time after puberty. On Comoros Island they live in larger unstructured groups with several males and females. Aggressive behavior is uncommon. Scent marking is very important sustained by rubbing branches with the crotch, forehead and hands. Unusual among primates, mongoose lemurs voluntarily share food with one another. In Mongoose lemurs mating is seasonal. Females experience estrus for about one month between April and June. They give birth to a single offspring per year, though twins are not rare. Young are usually born from August to October after a gestation period of about 128 days. Mothers will allow only other mothers to grooms their infants. Fathers play no part in infant care.